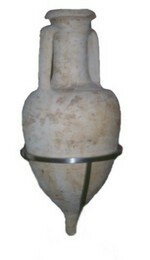 This is one of the more important amphora types of the Roman Republican period. In general it has a triangular-rim, cylindrical neck and sharply carinated shoulder. The ovoid handles are attached below the rim and on to the shoulders. Examples are sometimes stamped on the handle in Greek and Latin characters and symbols (Vandermersch 1994: 159-84). The body is commonly pear-shaped and has a short solid spike. It should be noted that the Dressel 1A also has a similar triangular-shaped rim, and identification between the two can be difficult on the basis of small fragments. In a pioneering work, Will (1982) distinguished five forms, 1A-1E that ran in a roughly chronological sequence. Although her typological groupings have been largely retained (except with the suppression of her form 1B), more recent work has changed the chronology and suggested origins of the form (particularly Tchernia 1986; Empereur & Hesnard 1987; Manacorda 1989; Vandermersch 1994). The typological sequence now runs as follows: 1A1, 1D, 1C and 1E: her type 1B is now understood to have been a transitional form 1D. The Will form 1A (=Vandermersch 5) dates to between the mid fourth and first decades of the third centuries BC. Will form 1B has been suppressed since it is now understood to be transitional to the Will form 1D (=Vandermersch 6), which dates to between c. 260/240 BC and c.220/210 BC. Will form 1C dates to between c. 260 and 210 BC and the first half of the second century BC, while the Will form 1E was produced between the late third and first half of the second century BC (see recent work by Lund, 2000). This form was widely produced in Tyrrhenian and Adriatic Italy, including Magna Graecia, southern Latium, Campania, Ischia, Etruria, Taranto, Salento, Spina/Adria and Aquileia (Empereur & Hesnard, 1987; Vandermersch, 1994; Tchernia, 1986: 42-53; Toniolo, 2000). More specifically analysis of name stamps and petrology led Will (1982) to suggest that her Type 1A may have been made in Sicily; this was confirmed by Vandermersch (1994: 79) along with evidence for kiln sites along the Golfo di Taranto in southern Italy. Will also suggested that her Type 1C may have been connected with Cosa, while Type 1D may have been made near Cosa and at Pompeii. It seems fairly clear now that Types 1C and 1D were manufactured at kiln sites in coastal Etruria, southern Latium and Campania, as well as in Lucania, Bruttium and in Punic Sicily (Vandermersch 1994: 85-7). Recent research has also suggested that the Greco-Italic type was also manufactured at Marseille in southern France, in the hinterland of Gades (Cádiz) in southern Spain (García Vargas, 1998: 69-71; 2000b: 61), and possibly north Africa (see Petrology for this type). The type as a whole is found predominantly in the western Mediterranean (Will, 1982), particularly in Italy and Sicily (Vandermersch, 1994), but also in southern France (Tchernia, 1986: 94-8), Spain (e.g. Molina Vidal, 1997: 63-153) and parts of north Africa, although it also occurs at a number of sites in the eastern Mediterranean, including Delos and Corinth (Will, 1982; Lund, 2000b).